In the latest Assassin’s Creed leak, a broken embargo has given us an Assassin’s Creed Odyssey release date. You will be able to start your Ancient Greek adventure on October 5th, 2018. A leaked dev diary – which appears to have intended to have gone live during Ubisoft’s E3 2018 showcase – reveals a number of details. The footage seems to indicate that the game lets you choose between pre-made male and female protagonists who both have links to the first civilisation. We also get a glimpse at our new Ancient Greek map, which looks to be bigger than that of last year’s Origins. The video also develops the game’s ship combat mechanics such as ship boarding and ramming. For all other leaks, announcements, and news, check out our E3 2018 hub page. Via VG247, the video seems to have first been published by Unilad Gaming on Facebook and YouTube, but it has since been taken down. 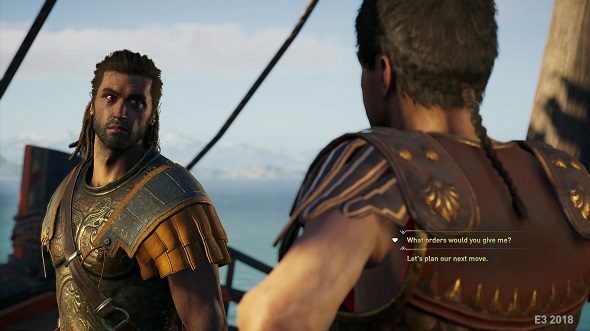 We hope the ships in Assassin’s Creed Odyssey are less leaky: screenshots have recently been prematurely revealed as well as crucial story details.